Some essential (and not-so-essential) information about wedding ceremonies and what you can expect from having me conduct yours. You’ve chosen to be married. Whether you are planning a big celebration of your love, or a more intimate and casual wedding, there are some first steps you should consider…. One of you asked, the other said, “Yes!” There is no rule that says that you have to tell everyone right away…you may take a few days to be excited together before sharing your news. When are ready to tell everyone, let your families in on the news first (in person is best), and then tell your besties. Once your nearest and dearest have been let in on your news, feel free to post away on social media! It may feel a less than romantic to begin your planning by looking at your budget, but you can’t make any decisions until you’ve established what you can spend. Decide together as to what your priorities are, do a little research, and come up with a number you are comfortable with. You then can play with how you want to use that money creatively. Remember, not everything costs money. Some of the best memories of your day will be how it felt, not what it looked like. There are as many different ways to celebrate the beginning of your life together as you can dream of. Feel free to think outside of the conventional box. Even if you are set on a formal event in a ballroom, you can play with the time of year, or time of day to help your budget. Think about options like a a cocktail reception rather than a plated meal. There are also many unconventional venues in and around Winnipeg that you may not have considered as a wedding venue. Part and parcel to this stage of planning is a rough idea of your guest list, as that number has a real impact on your budget and affect your choice of venue. Although it may seem counter-intuitive, you should look for your venue before you set the date, especially if you have your heart set on a particular space. Check out similar options depending on your vision. Don’t rule out meeting with venues you hadn’t considered…it is amazing what the right décor can do! Once you find a venue that checks off your boxes, prepare to set the date and nail down the vendors that you really want to hire. There are so many talented people in the Winnipeg Wedding Industry. The best of these book a year or more in advance. At the top of your list should be wedding planners, photographers, caterers, and officiants (that’s me!). Do your research; experience, professionalism and the ability to create and deliver quality product are important. Also, make sure you are meeting with registered businesses: someone who can be accountable for the products/service they offer. Although planning your wedding can be stressful, it should be exciting and fun! You and your partner have some decisions to make in the first few weeks of planning. Tackle them as a team and keep in mind that both of you should have input into what you want for your big day. Oh, my heart! The next chapter in Marin and John's love story was celebrated at the St. Norbert Arts Centre. Every detail of this whimsical wedding was authored by Marin, and attests to her DIY creativity. The grounds of the St. Norbert Arts Centre are quaint; the stately home is set in an overgrown English garden and boasts boardwalks and bridges. A friend of Marin's sewed garlands of banners and these were strung along the handrails of the walkways. The ceremony space included an arbour festooned with beautiful blooms. Luminous String Quartet played arrangements of both classic and modern tunes and, as they were set up on the verandah, the music floated over those assembled. Lights strung through the trees would be magical once the sun set. Marin and John created a ceremony with me and wrote their own, heartfelt vows that recalled their history together, what they loved about the other, and the promises they would strive to keep for all of their lives, together. A beautiful touch was the element of hand-fasting we included. 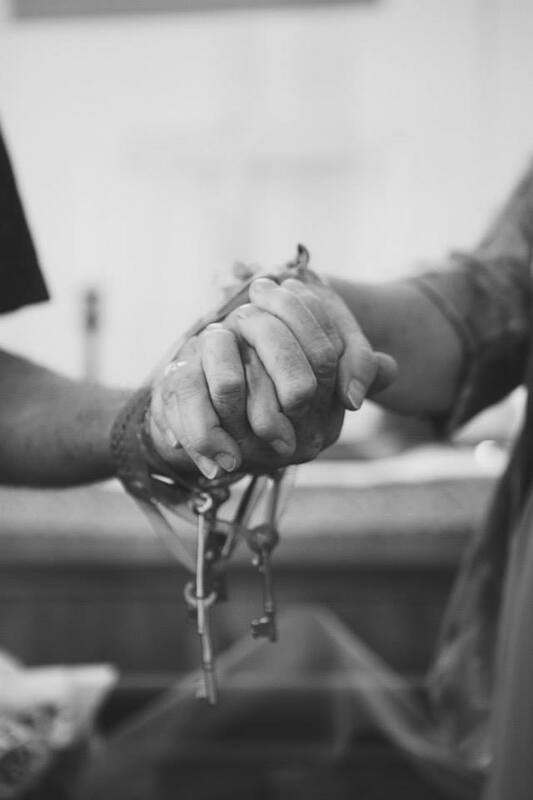 The handfasting reading was The Blessing of the Hands, one of my favourite readings, and the cords used to bind their hands were lengths of tartan and a ribbon printed with a quote from Guess How Much I Love You, "I love you to the moon and back." Marin and John chose not to have a wedding party and it made the ceremony feel that much more intimate. It was inside the reception space where Marin's vision really took shape. Because of their shared love of reading, what better way to begin the next chapter of their love story than surrounded by books? Marin made the backdrop of pages of their favourite novels, the tables were named for authors, and the seating chart was made of library cards with the wedding date as the "due date". Place settings were adorned with tiny paper hearts punched from book pages. Centerpieces included books, vases of flowers, and tea cups. Marin and John had a sweetheart table called "Chapter One" and a quote which read, "Now at last they were beginning Chapter One of the Great Story no one on earth has ever read, which goes on forever: In which every chapter is better than the one before." I wish them a story filled with adventure, a few plot twists, and the happiest of endings. I am pleased to share this blog post from The Wedding Guru, aka, Tammy Ouelette of Divine Weddings. I had the please of working with Chandra and Chris to create their ceremony and to officiate at their gorgeous wedding at Bridges Golf Course. I had the absolute pleasure of officiating at a very special ceremony this summer. My aunt and uncle renewed their wedding vows on the occasion of their 50th Anniversary. It was such an honour to officiate for them and to celebrate this milestone with the people I love best. Past, present, and future play a different role in a celebration of long love. The vows they renewed have already been lived many times, and so there was a depth to the words that resonated on a different level. In The Art of a Good Marriage (Wilfred Arlan Peterson) there is a line, "(Marriage) is forming a circle of love that gathers in the whole family." The truth of this was never more evident. The ceremony was held in a little chapel in the woods near Rainy River, Ontario. Because this was not a legal ceremony, I was able to officiate. We worked at creating a beautiful ceremony that gave honour to all the commitments they have made to each over over their lifetime together. It was interesting looking at readings and vows and reworking them so that they looked back as well as forward. 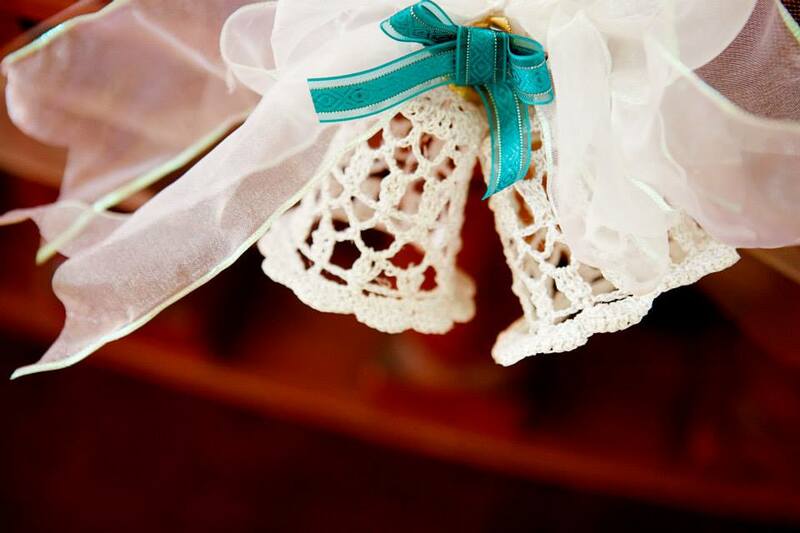 We are a sentimental family, and this was evidenced through all of the lovely touches my aunt included: the wedding bells were crocheted first for my own wedding 25 years ago by my grandmother. They have graced the aisles of every family wedding since. Three generations have now used them. When they aren't doing aisle duty, we hang them on our Christmas trees. My aunt and uncle reaffirmed their traditional vows (though much to my uncle's chagrin, she still refused to "obey"). 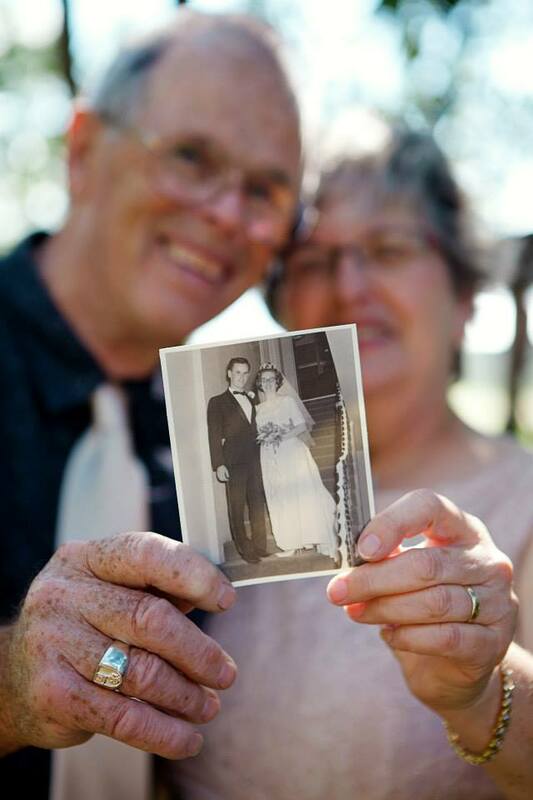 I was delighted to be a part of this milestone...I was lucky enough to be at their wedding 50 years ago (I was their flower girl) and hope to be able to celebrate many more anniversaries with this extraordinary couple. We should all be so lucky to have such excellent role models for long and happy marriage. For more photos please try the link below! I was pleased to be asked to lead off the new "Ask the Expert" column for It's Love Magazine by being their choice for "Expert" Marriage Commissioner! Here is the text of the article I wrote. You’ve shopped for the perfect dress, found a florist whose designs you love, and searched Pinterest for favours and décor that will help you to create the wedding of your dreams. The look of your wedding will be preserved in wedding photos, but the “feel” of your wedding will live on in the hearts of those celebrate with you. Your wedding officiant may be bound to a particular script (especially if you are being married in a church), but many Marriage Commissioners will work with you to offer a more personalized expression of your love. There are some elements that have to be included according to the Marriage Act of Manitoba. Ensure that your Marriage Commissioner includes the Declaration of Intent and the statement of vows as outlined in the Act; your civil ceremony is a legal exercise and the letter of the law must be followed. Once the legal requirements have been met, there is plenty of room for creativity. In order to ensure that your ceremony reflects who you are, you may want to consider the readings that are offered throughout the service. Countless words have been written on love and marriage and you can draw from a myriad of sources. Poets, prophets, and philosophers have waxed eloquent on love and having friends or family share readings during the ceremony helps to create a context of community. Your readings may invoke a sense of spirituality or simply confirm your feelings and beliefs about what marriage means to you. The public declaration of what is, essentially an intimate act, is most evident in the promises you make to one another. While some couples choose to write their own vows, others are more comfortable choosing vows from a selection or finding the elements they like in a number of texts and editing these to create their own. What is most important is that the words you choose reflect the feelings of your heart. It is not necessary for you each to say the same vows; in fact, often the most heartfelt ceremonies are those where each of you can express your feelings in the way the best suits your personality. Many couples also choose to incorporate elements from their cultures into their ceremonies. These symbolic rituals can add depth of meaning for families as traditional elements combined with modern sensibilities work together to create a fresh beginning for the newlyweds. The plethora of wedding shows on television has brought a number these elements to a new audience. Whereas in recent years unity candles were status quo, hand fastings, ring warmings, and sand ceremonies are becoming increasingly popular. Finally, do not underestimate music as an essential element in your wedding ceremony. Traditional selections such as Pachelbel’s Canon in D are lovely, but feel free to consider other music as well. However beautiful the tune of your favourite song, be sure the lyrics are in keeping with the spirit of the day, even if you are using an instrumental version. Processional music tends to be more formal in nature, with the recessional music often being a little more whimsical. If all of this seems a little daunting, remember that some Marriage Commissioners are happy to help you create the perfect ceremony for your special day. For example, I have a wide range of readings and vows that I have compiled from a variety of sources and can facilitate the selection of these so that your wedding ceremony is a unique reflection of the love you share. Although there are many wonderful wedding venues in Winnipeg, for pure opulence, there is none better than the Fort Garry Hotel. Emily and Jeff chose the seventh floor spaces of the hotel for their gorgeous celebration. The ceremony was held in the Concert Hall Ballroom and I truly believe this to be the most stately venue in all of Winnipeg. The fact that we were on a stage for the celebration of the marriage only served to gladden my drama teacher's heart. The loggia with its many conversation areas, all beautifully appointed, were excellent locales for photos, and the small fireside room was bedecked with family portraits and featured a bar which served up signature cocktails. The foyer space was used for cocktailsand appetizers before the doors to the Crystal Ballroom opened for dinner. I loved the whimsical touches in Emily and Jeff’s Fort Garry Hotel wedding. When you start with a space as inherently elegant as the Fort Garry, you can afford to really focus on the details. Guests were given beribboned wands to wave when the ceremony had ended and the effect was delightful. Emily and Jeff’s wedding had details in spades! I loved the wedding programs they created in the form of a newspaper. The format allowed Emily and Jeff to share their story as well as give the ceremony “Who’s Who”. Table numbers were replaced with hand-gilded animals, which somehow did not look out of place in the grand ballroom. I later learned their guest favours were piecesof gold- embellished flatware; the thought being that whenever you used the “odd”piece, you would remember where it came from. The ceremony itself was lovely. Emily and Jeff were easy to work with and the ceremony we created together was a reflection of who they are together. There were moments when the whole gathering was asked to participate, either by voicing their continued support for the couple, or in quiet reflection of their own loving relationships. 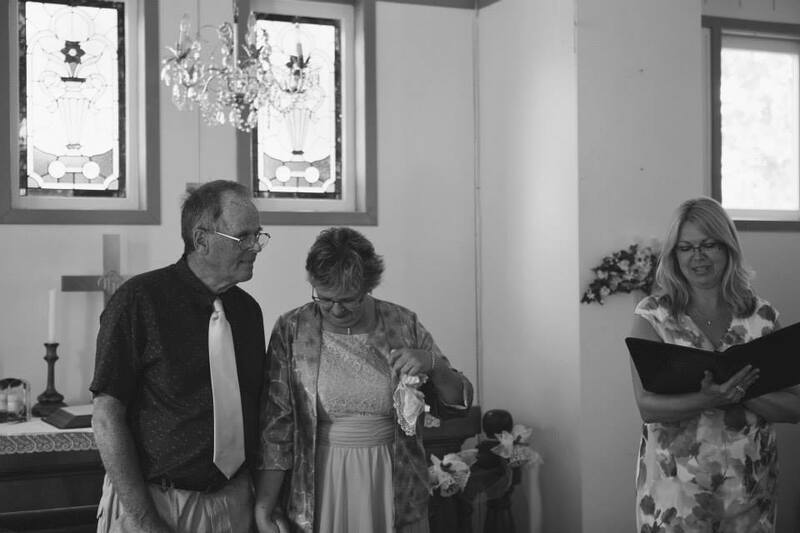 There were moments that were profoundly moving, and other moments (like the game of ‘rock, paper” scissors” that seemed to go on for a number of rounds before “who goes first with their vows” was determined) that moved us to laughter. This is always my favourite part of being a Marriage Commissioner: when two people in love are willing to share their joy through tears and laughter with each other and their friends and family…and me. I much prefer thinking of myself as a Celebrant, rather than an Officiant. Thanks, Emily and Jeff, for allowing me to be a part of your very special day. I love the idea of an outdoor wedding. Who wouldn’t, really? Winnipeg weather in the wedding season is always perfect: bright blue sky (but just enough cloud for photos, because photos are better if the sun isn’t too bright), warm rays of the sun (but not too warm because no one likes sitting in the sun when it’s 36 degrees in the shade), a gentle breeze blowing (but not too hard, because you’ve just spent a good three hours having your hair done), and the sounds of bird song and maybe water running in a nearby stream (but not airplanes, or traffic noises, or, god forbid, sirens blaring). Does this mean that if you plan an outdoor wedding you will be doomed? No, but it does mean that you are leaving a lot up to the weather gods and they are not always in a conciliatory mood. What’s a bride to do then, if she has her heart set on an outdoor wedding? She should plan for the worst and hope for the best. One of the first questions I will ask you after you tell me your plans for an outdoor ceremony is, “What is your Plan B?” I am not asking IF you have a Plan B, I am strongly suggesting there be such a plan. I know you want to get married outside, but Mother Nature does not always see things your way. Many of Winnipeg’s most popular outdoor venues have a backup plan already in place. It may be as simple as moving chairs in the reception space. This is often an excellent plan, for although it does require a bit of shuffling on behalf of the venue staff, the “up” side is that this space is already beautifully decorated! If you have chosen any of the outdoor spaces at Assiniboine Park, a brief chat with park staff will reveal that they have a well thought-out strategy in the case of inclement weather. When Hilary and Mike’s plans for a ceremony in the formal gardens were interrupted but a sudden summer storm, the park staff had us ensconced in the Conservatory within a matters of minutes! Decide ahead of time when the cut off time to change locales will be. If you are moving to an indoor location on the same site, your venue provider will let you know what the cut-off time will be. If you have to move to an entirely different location, more time will be necessary. Remember, I often perform more than one ceremony on a day and scheduling is determined by venue location. In considering a move indoors there is often more involved than moving your guests. If you just want to tough it out in the rain, I ask that cover be provided. At the very least, I require a large umbrella and someone to hold it. Your photographers and musicians may not be as accommodating as their equipment is expensive and may get damaged. Do not be upset if they will not work in the rain. In the familiar story, the porridge was too hot, too cold, and just right. Looking at it statistically, the porridge was edible only a third of the time. We assume that these were prepared under the same variables. Weather is unpredictable and can vary greatly from year to year. In fact, extremes in weather have been the rule of late, rather than the exception. You can’t assume that the weather will be perfect on your day, but can you can put some controls in place so that too hot and too cold may feel “just right” most of the time. In Winnipeg in the summer it is likely be sunny and hot. This season I saw a number of ways my couples helped their guests beat the heat. Lauren and Paul printed their programs on sturdy fans that were not only attractive, but also were a blessing on a hot day. Nicole and Jonny had water stations with bottled water set up for guests to enjoy before the ceremony began. And because she had dreamed of a Southern style wedding, Nicole and Rakiem served lemonade on the patio. You also may consider renting a large tent or sun shelter to shade the sun’s rays. A shelter may also prove handy should the weather turn… hot mornings on the prairies often give way to thunderstorms by afternoon. If you think the weather may be damp, have a number of umbrellas at the ready. Make sure you tell guests that it will be an outdoor wedding so they can wear extra layers. A few of the outdoor weddings at which I have officiated have had an “old-time country” vibe… having colourful quilts and blankets available for guests to cuddle under will add a little extra togetherness! Patio heaters can throw a fair bit of heat, too, though may not always be a practical solution. Consider your wedding style when planning an outdoor wedding. There are many styles of dresses that are suited to outdoor weddings. Because you won’t be in a temperature-controlled setting, you may do well to avoid heavy satin ballgowns. Choose a light weight fabric and style for you and your bridesmaids that reflect the more casual tone an outdoor wedding adopts. Again, remember the wind! Lightweight dress with full, short skirts may give your guests more than they came to see! I once officiated a wedding in a dress I thought was heavy enough to stay put, but had to tuck the skirt between my knees in order to maintain an air of decorum. Summer weddings are a great time to show off bare arms and shoulders and are a natural fit for strapless gowns. Do remember sunscreen if you are taking a lot of photos outside. Consider lightweight suits in a light colour for the men in your party. My favourite groomsmen this summer sported vintage style vests and bowties with rolled up shirtsleeves. If the weather is cooler, the guys are happier, but the ladies can be chilly. Have shawls at the ready to wrap up in. When we had a cold snap at the end of September last year, a quick trip to Wal-Mart for plush lap blankets saved the day when used as shawls in weather that had dipped near freezing. Does your outdoor venue require a long walk across a lawn? After a rain, a soggy lawn can be difficult to navigate in heels. Consider your footwear for the ceremony. Flats, sandals, wedges or barefeet can be appropriate choices. At Teresa and Jason’s wedding on the beach, the ladies wore beautiful beaded “barefoot sandals” made by one of the bridesmaids. Wind can have an impact on your ceremony in many ways. If you are wearing a veil, the wind can play havoc with the lightweight fabric. One solution is to buy a veil that is edged with crystal, or, one of my favourite tricks from this summer, buy or borrow some crystal earrings that can be clipped or attached to the veil. If you are considering using a runner, be sure it is a heavier fabric for outdoor use and secure it with stones or garden hooks. Personally, I would not bother with a runner for an outdoor wedding…it takes away from the natural look of the setting. If the breeze is light, candles may stay lit in a hurricane lamp, but open flame is never a good idea as a blowing veil will ignite easily. Consider using battery operated tea lights for effect, instead. Finally, wind can be distracting when heard through a microphone. Ask your d.j. or venue provider for a foam covering for the mic. I have found that that helps to cut down the wind noise significantly. Outdoor venues are likely to require sound amplification. There are a number of options available, but my preference is to have a cordless microphone on a straight stand (rather than a boom stand). A boom stand can be intrusive as it has a long arm that extends out and often comes between the bride and groom. I usually set the stand off to the side so that it is not in the way. Many officiants like to wear a lapel mic, but there are sections of the ceremony when I don’t like to be heard, and a lapel mic is hard to switch on and off. As mentioned above, the wind can be distracting when heard through a microphone. Ask your d.j. or venue provider for a foam covering for the mic. Outdoor weddings can be a feast for hungry insects. Try to select locations away from standing water and dense woods. This is especially important for weddings around dusk. When possible have the area sprayed for insects before your ceremony. Avoid wearing colognes and perfumes as they can attract insects. Most venues spray for nuisance mosquitoes. September weddings seem to be the worst for insects…especially wasps. They tend to be attracted to wedding bouquets. If you are afraid of or allergic to these creatures, plan accordingly. When you are scoping out spaces for your wedding, be sure to look at the gardens (or photos of the gardens) as they were a year before your wedding date. A bride who had chosen a beautiful city park for her wedding had chosen it in August. When her May wedding date arrived, she was dismayed to discover season’s flowers had not even been planted yet. It had not occurred to her that the garden would not be ready in time for her wedding. If your wedding is off the beaten path you may need to provide detailed maps and instructions for guests. Not all venues are easy to find if you are out in the country. Place signage at the corners of major routes to guide your guests to the right location. If you are being married at a private residence or cottage, parking may be an issue. Often country weddings can use a section of field as a make-shift parking lot. Be sure that you have permission to use it, mark parking areas clearly, and, if the parking is a distance from the ceremony space, consider renting a few golf carts to shuttle guests to the ceremony site. Uneven ground can be especially difficult to navigate for older guests. A wedding in an outdoor location like a park or private residence may also present another challenge: washroom facilities. Be prepared to rent port-a-potties. Public restrooms in parks may not be as clean as you might want. Have someone check on their condition and ask park staff about the cleaning schedule. Outdoor weddings can be absolutely beautiful. Nothing beats the décor that nature can provide, and we are blessed with so many beautiful parks and golf courses in and around Winnipeg. After our long winters it is a joy to be out in the fresh air and celebrate with friends and family. If you always keep in mind that (almost) everything can be planned for, you can have the outside wedding of your dreams. If not, your Plan B wedding will be the next best thing. At the end of the day, where you marry is not nearly as important as who you marry. I have been fielding a number of emails lately regarding Marriage Certificates and Change of Name. As previously mentioned in my “Getting Married in Manitoba” blog entry, once the ceremony has been completed and I have mailed in the signed marriage license, you may apply for a Marriage Certificate and take the steps necessary to change your name. As a Marriage Commissioner, it is my responsibility to ensure that I file all of the paperwork in a timely fashion. In fact,it is stipulated that I must do so within 48 hours of your ceremony! Unfortunately, I cannot give you a copy of any of the documentation. When you purchase your licence from a registered vendor, you are given a form to fill out and submit once the ceremony has been completed and the paperwork filed. If you misplace the form, you can easily access the information on line http://vitalstats.gov.mb.ca/Certificates.html. There is a fee attached to the certificate. I am not allowed to apply on your behalf. If either of you are changing your surname, you would do so once you have received the Marriage Certificate. http://vitalstats.gov.mb.ca/ChangingIdentification.html (You can call yourself Mr. and/or Mrs. NewName as soon as you want…but in order for your new name to be legally recognized on documents, you must contact the various agencies yourself.) This information is provided by Vital Statistics http://vitalstats.gov.mb.ca/pdf/Changing_identification.pdf. I hope this information helps you to navigate the process a little more smoothly. What I have learned in the past 2 years is that there is no such thing as a "typical" wedding. I have seen both ends of the spectrum: from lavish and extravagent weddings at a posh hotels to the "just us and a few witnesses on the deck" ceremonies. In all cases, the end result is the same: Married! I absolutely loved the country details in the August 18th wedding of Miranda and Huw and thought I would write about how a simply beautiful wedding on a modest budget can be achieved. Miranda and Huw opted to host their guests in a large yard in Anola, Manitoba. They were blessed with a beautiful day and were married under the big prairie sky. The bride had chosen a blue, white, and yellow colour scheme which was perfect in the outdoor setting mirroring the sky and wheat. A simple, rustic arbour helped to define the space and guests were seated on sheet-covered haybales. A white runner edged by hay created the aisle and was flanked by white lanterns suspended on stands. 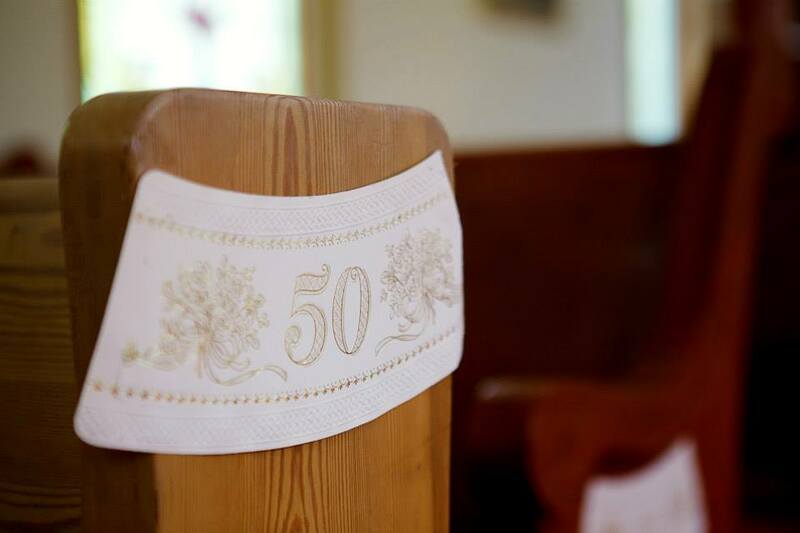 To one side, a simple white table and chair held a navy and pearl covered box where later in the ceremony, Miranda and Huw would place love letters written to one another to be shared on their 10th anniversary. The reception tent held long tables that were draped in white linens. Burlap runners and navy napkins bound with jute and adorned with yellow straws added a pop of colour,as did the big bunches of cut flowers in simple glass vases. White lanterns containing large pillar candles sat on the table to be lit after the sun went down. A display of guest favours (mason jars filled with cookie dough ingredients and covered with a navy and white fabric) was created in an applecrate and added to the rustic charm. The total cost for the wedding fell under $5000. How did she do it? Miranda says, "I used the wedding show as a great starting point and kijiji. I spent many long nights on the computer searching for the best prices. My biggest thing was the burlap runners and that was the hardest to find but I spent a lot of time shopping around since we had a tight budget. We didn't want it to look like we cut corners and we didn't want something that looked "cheap" so I think that was our biggest challenge. Most rewarding was finding things that worked together and seeing them all set up: right from the bales to the table runners to the mason jar cookies to the cake stand." Vital Statistic Manitoba provides a wealth of information for couples who wish to be married in Manitoba. Here is a summary of what you need to know ,taken from the Vital Stats website. I have made a few notes within the text for clarification purposes. "Marriages are performed by registered clergy or registered marriage commissioners. You may choose a religious ceremony or a personal ceremony with a marriage commissioner. You must also prove that you are eligible to be married. Single - (never married) and over 18 years of age. Divorced persons are required to show one of: Divorce Certificate, Decree Absolute. Persons whose spouse is deceased must show:Death Certificate or Funeral Home Certificate or Obituary clipping from the newspaper. Provide identification for proof of age (18 years or older). Acceptable documents for identification can include:Birth Certificate, Passport or US Passport Card, Citizenship Certificate (Canadian or United States), Canada Immigration documents, Canadian Armed Forces Identification Card, Government of Canada Indian Status Card, Fire Arms Card, Driver's Licence (photo ID) with one of the following:Manitoba Health Card, Senior Citizen Card, Change of Name Certificate, Employee Card (with birth date), Social Insurance Card." Make your arrangements with a clergy or a marriage commissioner. Give your licence and the white self-addressed envelope to your marriage commissioner or clergy. I will accept your license at the wedding rehearsal. If you are opting not to have a wedding rehearsal with me, then you may drop off your licence to me any time prior to your ceremony date. Both parties, your witnesses, and the clergy or marriage commissioner who performed the ceremony must all sign the Marriage Registration.The clergy or marriage commissioner will send the Marriage Registration to our office to officially register your marriage. Note: Vital Statistics Agency does not automatically issue a Marriage Certificate. You have to apply for your Marriage Certificate. I am unable to apply for you. The request form is given to you when you purchase your Marriage Licence. You may request the certificate any time after your ceremony. It is my practice to mail the licence to the Vital Statistics office immediately following your ceremony. You may retain your present surname; You may assume your spouse's surname or common-law partner's surname; You may combine your present surname with your spouse's or common-law partner's surname, with or without a hyphen (it does not matter which surname you use first); or You may assume your spouse's or common-law partner's surname and retain your present surname as a given, middle name. All options apply equally to men and women. If you were born in Manitoba, your birth certificate does not change to your married name or common-law partner's name. This information applies to Manitoba residents. It is your responsibility to change your name on your personal identification and documents. In most cases, a marriage certificate or change of name certificate will be required. To view a list of some offices you may have to notify if you are assuming a new name, please visit the Vital Stats web site.